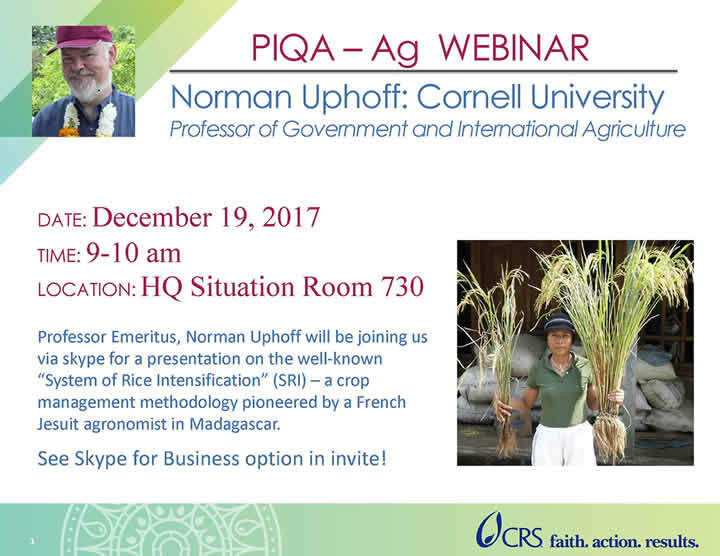 Norman Uphoff will present at PIQA-Ag webinar on December 19 entitled System of Rice Intensification (SRI) – a crop management methodology pioneered by a French Jesuit agronomist in Madagascar. This CRS event, which will take place 9-10AM (EST) is available to the public through Skype for business or phone. (See SRI-Rice events page for details). Our SRI-Rice Selected News Updates for November (on ScoopIt) as well as the November additions are now available. October 2017 statistics are as follows: 3,157 unique visitors from 93 countries logged 4,082 sessions in which 7,221 pages were viewed. Our primary Facebook page now has 2,403 "likes," the SRI Equipment Innovators Exchange has 339 members and our primary YouTube channel, which now has 492 total followers, had 3,259 new views for our 88 uploads; 161 views of our 41 playlists. The twitter account has1,665 total followers. Slideshare had 9,000 views of our 486 uploads; 220 followers. There are 1,215 items (17 new this month) in our Zotero research database. Norman Uphoff will be attending the Soil & Nutrition Conference, which will be held in Southbridge, Massachusetts, on November 29-20, 2017. He will give an oral presentation entitled Biofortification of staple food through agronomic means rather than varietal changes. Mark Fulford, a well-known member of the SRI Community will also present at the conference. Norman Uphoff led a brown bag talk on SRI and SCI at the USDA Foreign Agricultural Service,1:30-1:30 on Monday, November 6. 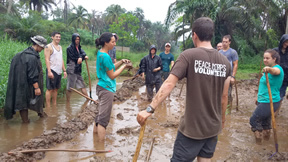 He was joined by colleagues from Oxfam and Catholic Relief Services as well as former Peace Corps volunteers Hillary Mara and Craig Zarnosky, now with USDA/FAS, who arranged for the event along with Devon Jenkins. Our SRI-Rice Selected News Updates for October (on ScoopIt) as well as the October additions are now available. October 2017 statistics are as follows: 3,117 unique visitors from 87 countries logged 4,005 sessions in which 7,533 pages were viewed. Our primary Facebook page now has 2,400 "likes," the SRI Equipment Innovators Exchange has 341 members and our primary YouTube channel, which now has 474 total followers, had 2,544 new views for our 88 uploads; 348 views of our 41 playlists. The twitter account has1,659 total followers. Slideshare had 7,616 views of our 471 uploads; 220 followers. There are 1,198 items (25 new this month) in our Zotero research database. Devon Jenkins, SRI-Rice Technical Advisor, has completed the 2017 SRI World Map, which is now accessible through the SRI-Rice home page and the 'About Us' page. The map (click on the map to enlarge) lists four levels of SRI development in the 58 countries for which SRI has been demonstrated. 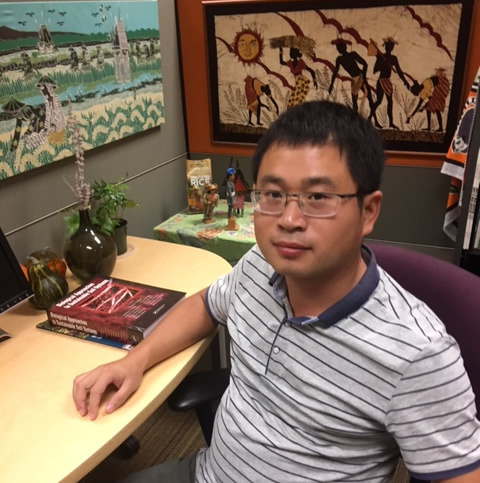 Min Huang, visiting fellow with SRI-Rice, has published a paper in the Journal of Integrative Agriculture together with colleagues at Hunan Agricultural University. The article, entitled Why high grain yield can be achieved in single seedling machine-transplanted hybrid rice under dense planting conditions, suggests that improvement in seedling quality, panicle size, and dry weight per stem are critical to the high grain yield in single seedling machine-transplanted hybrid rice under dense planting conditions. 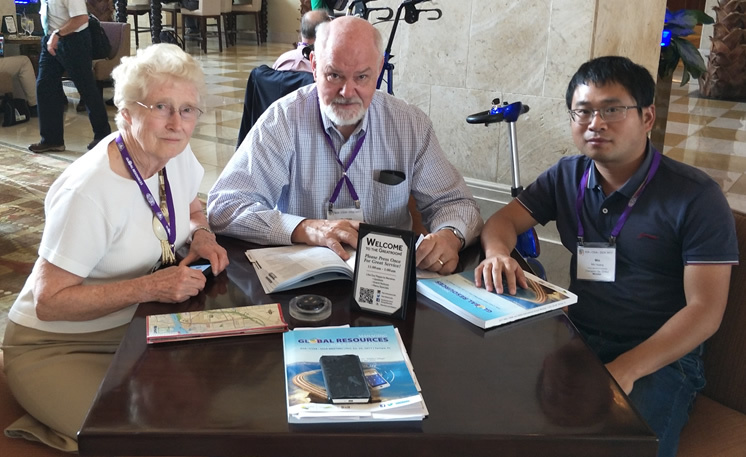 Norman and Marguerite Uphoff, together with Min Huang, SRI-Rice Visiting Fellow, attended the 2017 International Annual Meeting of ASA-CSSA-SSSA, held October 22-25, 2017, in Tampa, Florida. They were joined by Amod Thakur, ICAR-Indian Institute of Water Management, who gave an oral presentation on the Impacts of Cultivation Practices and Water Management in the Post-vegetative Stage on Rice Grain Yield and Water Productivity. They were joined by Amod Thakur, ICAR-Indian Institute of Water Management, who gave an oral presentation on the Impacts of cultivation practices and water management in the post-vegetative stage on rice grain yield and water productivity. 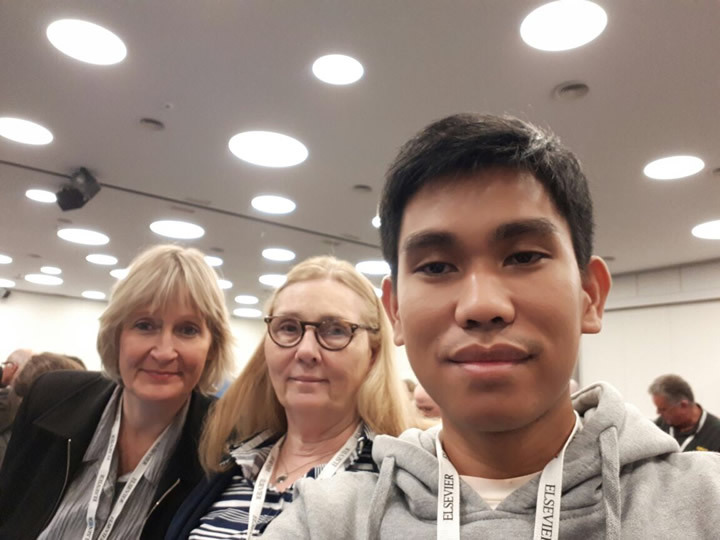 Norman made a presentation co-authored by Amod on Climate-Smart Agriculture: How Modified Crop/Water Management under the System of Rice Intensification (SRI) can Contribute to More Climate-Resilience and Higher Factor Productivity. Our SRI-Rice Selected News Updates for September (on ScoopIt) as well as the September additions are now available. September 2017 statistics are as follows: 2,996 unique visitors from 79 countries logged 3,869 sessions in which 6,491 pages were viewed. Our primary Facebook page now has 2,391 "likes," the SRI Equipment Innovators Exchange has 341 members and our primary YouTube channel, which now has 460 total followers, had 2,417 new views for our 88 uploads; 317 views of our 41 playlists. The twitter account has1,656 total followers. Slideshare had 6,997 views of our 469 uploads; 217 followers. There are 1,173 items (11 new this month) in our Zotero research database. 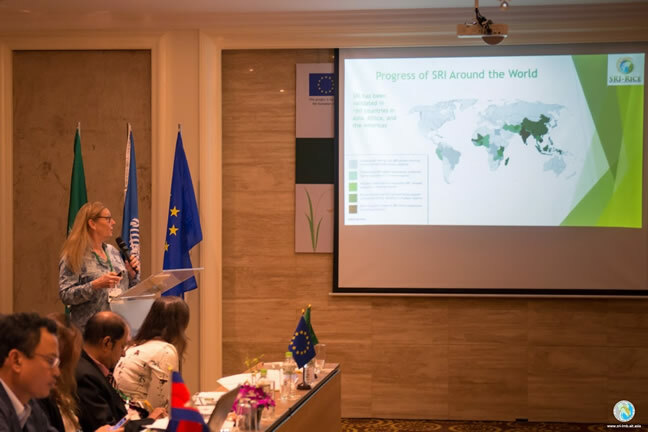 SRI-Rice was present as an official observer at the Sustainable Rice Platform meeting held at the United Nations Convention Centre (UNCC) in Bangkok on October 3. 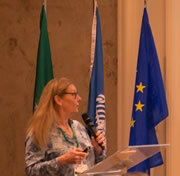 Lucy Fisher made a presentation, entitled Networks, Champions, Incentives and the Uptake of the System of Rice Intensification (SRI), at the 2017 Sustainable Rice Conference and Exhibition, October 4-6, 2017. 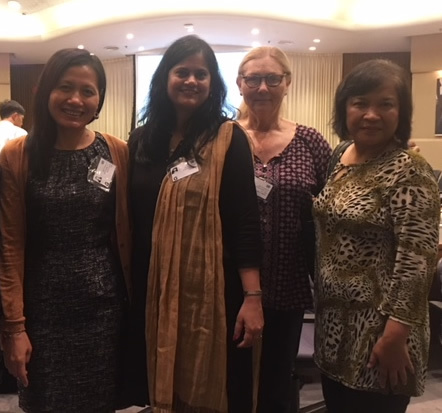 Minh Le (far left) and Abha Mishra (center left), shown at right with Lucy and Anizan Isahak (far right), also gave presentations on SRI at the conference. 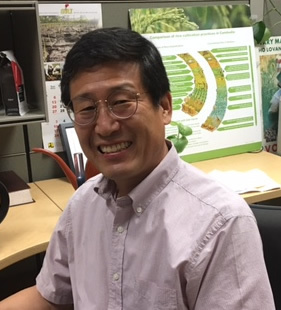 Dr. Min Huang, Associate Professor of Agronomy at Hunan Agricultural University, has joined SRI-Rice as a Visiting Fellow with International Programs in the College of Agriculture and Life Sciences. During his one-year stay (September 2017-August 2018), he will be working on several papers that relate to the the use of single seedlings and other practices related to rice production. You can find his recent research articles on his ResearchGate page. Our SRI-Rice Selected News Updates for August (on ScoopIt) as well as the August additions are now available. August 2017 statistics are as follows: 3,584 unique visitors from 86 countries logged 4,655 sessions in which 8,462 pages were viewed. Our primary Facebook page now has 2,373 "likes," the SRI Equipment Innovators Exchange has 341 members and our primary YouTube channel, which now has 440 total followers, had 2,911 new views for our 88 uploads; 221 views of our 41 playlists. The twitter account has1,652 total followers. Slideshare had 7,734 views of our 469 uploads; 215 followers. There are 1,162 items (8 new this month) in our Zotero research database. Our SRI-Rice Selected News Updates for June (on ScoopIt) as well as the July additions are now available. July 2017 statistics are as follows: 3,501 unique visitors from 86 countries logged 4,458 sessions in which 8,384 pages were viewed. Our primary Facebook page now has 2,359 "likes," the SRI Equipment Innovators Exchange has 342 members and our primary YouTube channel, which now has 422 total followers, had 4,238 new views for our 88 uploads; 376 views of our 41 playlists. The twitter account has1,634 total followers. Slideshare had 8,862 views of our 469 uploads; 215 followers. There are 1,154 items (11 new this month) in our Zotero research database. Joongdae Choi, Visiting Fellow with SRI-Rice at International Programs/CALS, completed his three-month stay at Cornell University during August. While at Cornell, Dr. Choi worked on journal articles about SRI-related GHG issues and also authored an overview of SRI and Climate Change Mitigation for the SRI-Rice website. The increasingly prolific Norman Uphoff has authored an article entitled SRI: An agroecological strategy to meet multiple objectives with reduced reliance on inputs, which is published in the journal Agroecology and Sustainable Food Systems [41(7): 825-854]. He also co-authored an article during July with Febri Doni et al in the journal Organic Agriculture. the title is A simple, efficient, and farmer-friendly Trichoderma-based biofertilizer evaluated with the SRI Rice Management System. Our SRI-Rice Selected News Updates for June (on ScoopIt) as well as the June additions are now available. May 2017 statistics are as follows: 3,460 unique visitors from 89 countries logged 4,462 sessions in which 8,186 pages were viewed. Our primary Facebook page now has 2,353 "likes," the SRI Equipment Innovators Exchange has 340 members and our primary YouTube channel, which now has 409 total followers, had 4,063 new views for our 88 uploads; 473 views of our 41 playlists. The twitter account has1,625 total followers. Slideshare had 6,480 views of our 469 uploads; 214 followers. There are 1,143 items (14 new this month) in ou Zotero research database. Our SRI-Rice Selected News Updates for May (on ScoopIt) as well as the May additions are now available. May 2017 statistics are as follows: 3,665 unique visitors from 94 countries logged 4,854 sessions in which 8,842 pages were viewed. Our primary Facebook page now has 2,334 "likes," the SRI Equipment Innovators Exchange has 335 members and our primary YouTube channel, which now has 376 total followers, had 3,123 new views for our 88 uploads; 331 views of our 41 playlists. The twitter account has1,604 total followers. Slideshare had 5,222 views of our 466 uploads; 213 followers. There are 1,129 items (31 new this month) in our Zotero research database. Naadhira Ali (right), a graduate student in the International Agriculture and Rural Development Program at Cornell, has joined SRI-Rice to assist with the website migration and to curate English and French research for the SRI Research database. Nina Lin will stay at Cornell for the summer to help with the website transition as well. Eurika Nzouatcham is spending the summer at a hospital in Ghana. Hillary Mara has completed her MPA degree and moved to Balitmore to intern with Catholic Relief Services (CRS). Bella Culotta will spend the summer in Nepal as a Borlaug Ruan intern with ICIMOD working on solar-powered water pumps. Hanzhou Yang will be in China until the end of the year. On May 5, an article by Amod Thakur and Norman Uphoff entitled How the System of Rice Intensification can contribute to Climate-Smart Agriculture appeared in Agronomy Journal [109(4): 1-20. doi:10.2134/agronj2016.03.0162]. A second article by Norman Uphoff, The System of Rice Intensification’s role in hunger, climate change, and communities, was published on the Food Tank website on May 9. Our SRI-Rice Selected News Updates for April (on ScoopIt) as well as the April additions are now available. April 2017 statistics are as follows: 3,597 unique visitors from 87 countries logged 4,737 sessions in which 8,978 pages were viewed. Our primary Facebook page now has 2,309 "likes," the SRI Equipment Innovators Exchange has 331 members and our primary YouTube channel, which now has 366 total followers, had 2,482 new views for our 88 uploads; 246 views of our 41 playlists. The twitter account 1,594 total followers. Slideshare had 7,581 views of our 466 uploads; 212 followers. There are 1,098 items (7 new this month) in our Zotero research database. Our SRI-Rice Selected News Updates for March (on ScoopIt) as well as the March additions are now available. March 2017 statistics are as follows: 3,859 unique visitors from 89 countries logged 4,806 sessions in which 8,677 pages were viewed. Our primary Facebook page now has 2,216 "likes," the SRI Equipment Innovators Exchange has 322 members and our primary YouTube channel, which now has 360 total followers, had 2,201 new views for our 88 uploads; 319 views of our 41 playlists. The twitter account 1,585 total followers. Slideshare had 7,805 views of our 466 uploads; 205 followers. There are 1,091 items (25 new this month) in our Zotero research database. Returned Peace Corps Volunteers at Cornell who promoted SRI during their service lead a roundtable discussion on the Peace Corps experience with SRI to let prospective Peace Corps Volunteers know about opportunities to get involved with SRI. The event took place April 28, 2017 (2:30 - 4:00PM) in 102 Mann Library, on the Cornell campus. Devon Jenkins and Hillary Mara (leading the training at right) are among the RPCV speakers at the event, which is sponsored SRI-Rice, Peace Corps Cornell, and IP/CALS. More information on the event can be found on the Cornell event calendar or the Facebook event page. Several members of the global SRI Community attended the 2nd Agriculture and Climate Change Conference e in Sitges, Spain, held March 26-28. Lucy Fisher presented a poster entitled the System of Rice Intensification (SRI): An eco-digital commons for knowledge sharing. Febri Doni, a member of the SRI-Mas Network in Malaysia, gave an oral presentation on the Physiological effects and transcriptomic profiling of rice plant-microbe interactions in a System of Rice Intensification (SRI) agroecosystem: Identifying phenotypical modifications to deal with climate change. His presentation was co-authored by N. Uphoff, C.M.Z. Radziah, A. Isahak, F. Fathurrahman, and W.Y.W. Mohtar. Erika Styger also presented a poster on a new conceptual framework for the System of Rice Intensification (SRI) for research and practice. Febri, Lucy and Erika are shown at right. Norman Uphoff co-authored an article with Anchal Dass and Subhash Chandra entitled Agronomic fortification of rice grains with secondary and micronutrients under differing crop management and soil moisture regimes in the north Indian plains. The article appeared March 11 in the journal Paddy and Water Environment. He co-authored a second article about India with Arun Balamatti entitled Experience with the System of Rice Intensification for sustainable rainfed paddy farming systems in India. The article, which appears in Agroecology and Sustainable Food Systems, was first published March 20, 2017. Finally, Uphoff co-authored a Kenyan article by Jackline Ndiiri et al that appears in the American Journal of Plant Biology. The article is entitled Comparison of yields of paddy rice under System of Rice Intensification in Mwea, Kenya. Our SRI-Rice Selected News Updates for February (on ScoopIt) as well as the February additions are now available. February 2017 statistics are as follows: 3,686 unique visitors from 94 countries logged 4,902 sessions in which 9,137 pages were viewed. Our primary Facebook page now has 2,179 "likes," the SRI Equipment Innovators Exchange has 317 members and our primary YouTube channel, which now has 339 total followers, had 2,313 new views for our 88 uploads; 255 views of our 41 playlists. The twitter account 1,562 total followers. Slideshare had 8,553 views of our 462 uploads; 205 followers. There are 1,066 items (16 new this month) in our Zotero research database. "稻作革命 SRI (System of Rice Intensification)," the Chinese language version of Norman Uphoff's 2016 book "The System of Rice Intensification (SRI) - Responses to Frequently Asked Questions," was published in early 2017. The Chinese version, which has an extended section on SRI in Taiwan, was co-authored/translated by Zhang Yu Quan and Shan Lu Yong Si at the request of Yu Chuan Chang. The cost on the book, which can be obtained on the PChomeUSA site, is US$21.49. The SRI-Rice January Newsletter was published on February 13. The highlights included news from Bhutan, Cambodia, Guinea, Haiti, India, Indonesia, Iraq, Liberia, Thailand, and the USA. The online news also included a link to the list of all the items found online by SRI-Rice about SRI during 2016. SRI-Rice's Senior Advisor gave a talk at Kendal in Ithaca, NY, at 7:15PM on February 8. The title of the presentation was Reasons for Hope: Opportunities for Meeting World Food Needs with Lower Cost, Less Water, Less Adverse Environmental Impact, and with Resilience to Climate Change. The January website additions are now available online. January statistics are as follows: 3,386 unique visitors from 76 countries logged 4,395 sessions in which 8,014 pages were viewed. Our primary Facebook page now has 2,174 "likes," the SRI Equipment Innovators Exchange has 314 members and our primary YouTube channel, which now has 327 total followers, had 2,424 new views for our 88 uploads; 404 views of our 41 playlists. The twitter account 1,550 total followers. Slideshare had 8,062 views of our 461 uploads; 204 followers. There are 1,050 items in our Zotero research database. Olivia Vent, SRI-Rice Value Chain Advisor, traveled to Uttarakhand, India, during mid-January together with Sue Price and Declan McCormack of Flooded Cellar Productions. They are in India to collect footage for a video on SRI's impact on women that will be used for public education and for fundraising purposes for a new NGO focused on SRI and CA. Cornell's Conservation Agriculture Knowledge Resources website, which is managed by SRI-Rice, has made significant progress in migrating the existing website to a new Drupal platform. The CA Group has also published the January edition of the CA Research Highlights. Our SRI-Rice Selected News Updates for December (on ScoopIt) as well as the December additions are now available. December statistics are as follows: 3,199 unique visitors from 87 countries logged 4,154 sessions in which 7,582 pages were viewed. Our primary Facebook page now has 2,166 "likes," the SRI Equipment Innovators Exchange has 306 members and our primary YouTube channel, which now has 315 total followers, had 2,783 new views for our 88 uploads; 380 views of our 41 playlists. The twitter account 1,538 total followers. Slideshare had 9,343 views of our 461 uploads; 203 followers. There are 1,047 items (8 new) in our Zotero research database. 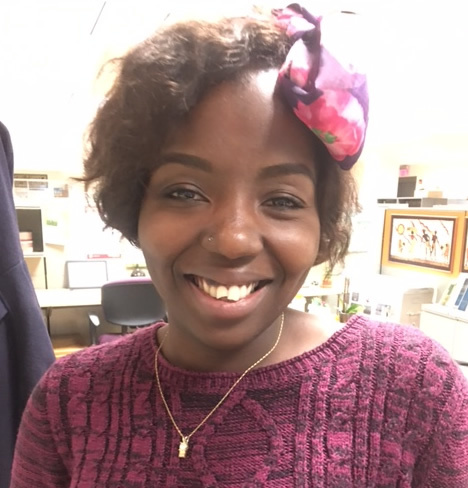 Eurika Nzouatcham, a junior studying biological sciences at Cornell, has joined SRI-Rice to help out out with the new SRI-Rice website. She will be working with Bella Coulatta to redesign the 55+ country pages for our Drupal website which will be completed in 2017.